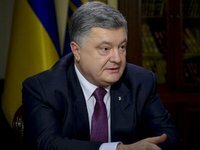 Ukrainian President Petro Poroshenko has sent proposals to Kyiv's foreign partners regarding possible sanctions on Russia over the incident in the Kerch Strait, deputy head of the presidential administration's Foreign Policy and European Integration Department Serhiy Leshchenko said in Kyiv on Wednesday. "We are working to draft a new package of 'Azov sanctions,' which would include an expansion of the sanctions that the European Union and the United States have already imposed for building the Crimean Bridge," Leshchenko said. "The president provided our partners with information about the individuals and vessels involved in the act of aggression in the Kerch Strait and the judges and prosecutors responsible for the arrest of our unlawfully detained sailors," he said. Ukraine is discussing the imposition of these sanctions with its partners, Leshchenko said.